Some of the good news is that Katy slept really well last night. Thanks to Dawn Ives for staying overnight with her! It was great to see how well Katy was doing when we arrived this afternoon. She looked great! Below are two pictures, one of her with all her “equipment”, and another of when we got there this afternoon. Forget hospital gowns… this girl goes in style! My parents were actually able to go to church this morning for the first time in several weeks. That was really refreshing for them. Then, we all met at the hospital around 3pm and had a time of worship together with my brother playing guitar. It was a sweet time of prayer, singing, praise, thanksgiving, and reflection on God’s goodness. Katy really enjoyed it. Katy also had an X-ray of her belly tonight because it was a little bit distended (bloated). For Katy’s body to rest up from all that physical activity (good thing she’s on pain meds). For an accurate report from the MRI, EEG, and X-ray. For Katy to continue gaining strength. Thank you so much for the many comments we’ve gotten this weekend. They’ve been such an encouragement! I wish we had time to respond to all of you individually! You look so great in your pictures!! I am so glad. I cannot tell you how thankful I am for this blog and for Colin’s faithfulness in updating it. It is truly encouraging to see how God is preserving and keeping you as well as the number of people around the U. S. that are praying for you!! I would really love to come see you sometime, so if you feel up to it in the coming weeks, please let me know. I’ll even bring chocolate. I just wanted to let you know that I’m praying along with everyone. My family and the blog is keeping me updated. I’ve also told Chris & Buffy about it and they are praying too. You are so courageous. As I’ve read all these comments and heard about all the visitors you’ve had, I have been amazed at how God has blessed your family with so many who care for you. And it is really cool that as God blesses you, you are blessing others, especially to the lady in the next room who had no visitors. You are a gem, Katy. I’m so glad to hear you are doing better, and that you have connected with the very helpful resources of the HPS Network & Dr. Gahl. I’m the mother of one of other girls who were adopted from India who have HPS. I sent some more detailed information to an email I got for your mom, Dawn. Hope you continue to improve, and will keep you & the family in my thoughts. We at St. Patrick’s sure are praying for you and all your dear family and friends, who are helping you through this ordeal. Your faith and strength are an inspiration to us all. Get better soon, and we’ll see you this spring at St. Pat’s for another Mother’s Day Baby Shower! Several years ago, I suggested the idea of the spiritual adoption program for our students with the baby shower to complete the 9 month span. We haven’t met as I am in a wheelchair and cannot go downstairs at St Pat’s, but I have heard lots about you and your mom . God has given me plenty of time for prayer and you are in them each day. I am so glad to see the pictures. You look really good. Maybe you will come upstairs to see me for the baby shower in 2007. I would like that so much. Keep smiling. Wow! Estel and your mom connected before I even got a chance to tell her about you! I’m working on contacting another family I think you’ll be excited to meet. In the meantime, just checking in to see how you’re doing. Keep getting better! 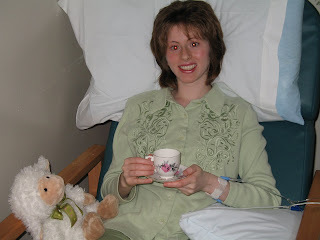 I checked Heather’s blog as soon as I got home from the hospital this morning. She posted your blog information on her site yesterday, so you may be getting even more messages from people who are concerned about you. And hopefully, a lot more people praying too! I am praying that you will have no more spasms and that God’s peace will quiet your spirit. I love you. Thank you for being such a blessing to me. I am proud of you for taking such a stand for the Lord and sharing about his goodness and faithfulness to all who enter your room. The Lord has great plans for you. You are a remarkable young woman. I hope we get to have another sleepover. I’m praying for you and your family. P.S. I hope your mom is not upset about our banana splits! Hey Katie. Your Aunt Julie just got back from your sleepover at the hospital. You’re going to get a reputation as a party animal with all these sleepovers you’re having. You are such a blessing to our family. I received a phone call from your mother this morning and was sorry to hear that you are in the hospital. On behalf of the staff of the Department for the Blind and Vision Impaired, I want you to know that you are in our thoughts and prayers. Wow, you are looking mah-va-lous! It is good to see the twinkle in your eyes. I’d love to see God’s “Hit Counter” on your Heavenly prayer site! We will keep that counter spinning, and your job is to keep getting stronger. Don’t you wonder what’s in that TPN? P.S. I don’t believe that I’ve seen a dystonic reaction to Reglan in anyone more than … 6 weeks of age. Babies don’t care for them much, either. It is good to see the list of prayer requests, it helps to know how to pray for Katy each day! Katy, you do look wonderful in the pictures! I’m so glad that you are looking healthy and gaining strength. Hope to see you soon! What beautiful pictures of you! I’m so grateful for this blog so we can keep close tabs on your progress and prayer needs. You have such an awesome family. We’re continuing with you in prayer.. day and night!! I just heard about you being in the hopsital this past Sunday in church. Along with telling us you were in the hospital Pastor Mike gave out your blog address. I’m so glad he did I was able to show Tabitha your picture and explain to her that you were in the hospital. You have now been added to her nightly prayers. She has missed seeing you on Wed. nights. Tabitha sends you her love. My name is Sheena King and I live in St. John’s, NL Canada. I wanted to write to you and say hello and also to say my family has been where you guys are today and we’re doing ok. For now we’re all doing pretty well. Ok let me see if I can break this down a little for you, make it as short as I can. I have two older brothers, one of them Dion, is fine, healthy doing great. Myself and Kirk on the other hand are doing ok now but we’ve certainly had out share of medical issues over the years and I wanted to let you guys know you’re not alone and you have friends in Canada even if we’ve never met. WE both have a very rare condition as well, in fact there is no name on it. We’ve recently been tested for HPS, which they told us we had for years, but all the tests were negative for it. We have Crhon’s Disease, a very rare pretty complicated white blood cell/platelette disorder and I have Albinism as my brother do not, or not so you can tell right away anyway. Kirk spent the best part of a year going through exactly what you are going through now Katy. He was very malnurished and was on TPN for a long time and had a lot of complications with his electrolyes. I won’t go into all this any further, I wanted to introduce myself and just say hello I guess. Heather Kirkwood was telling me a bit about your story and pointed me in the direction of your blog which I’ve just been reading. Keep your chin up Katy, be positive and know I am rooting for ya even if we’ve never met, this world seems a lot smaller then we might think sometimes. By the way as well if you are in contact with the NIH its an amazing place with an awsome HPS team who will take really amazing care of you. I was down there in May and they were extremely great to me. Maybe we can become email buddies. Your grandpa’s birthday celebration sounds wonderful! I was thinking that you have a very special understanding of being adopted into a dear and faithful family but isn’t it wonderful that we are adopted into the family of God? What an unfathomable truth that we are sons and daughters of the King, our most high Lord. Rich and I continue to pray for your strength and spirit. It is almost Autumn. Where did the last month go? I am wondering how you are doing and hope someone will update your blog soon. I am getting ready to go into town for some errands. The way the wind is blowing, it may turn my wheelchair into some kind of wind=propelled machine! Look out Lexington!